Professional, results-driven and creative are the words most often used to describe Laurie (formerly Laurie Sillay Lahr). 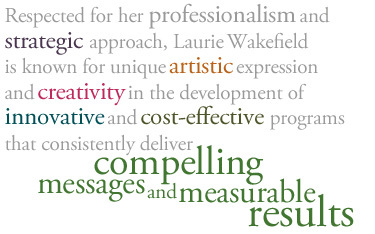 The combination of powerful and engaging visual presentation combined with clear verbal communication is top priority and consistent throughout her work, which has been recognized through many design publications and advertising awards. An Internet and media enthusiast, Laurie brings years of Public Relations experience and applies the most current technologies and applications to reach and engage target audiences, generate leads, measure results, and nurture productive business relationships for her clients.